Hacienda Aurelia was owned by Corsican immigrant Domingo Emanuelli Costa (1845-1922) who was married to Aurelia Amy Dominguez, hence the name of the Hacienda. It was also known as "Haciendita Emanuelli" because it was the smallest ingenio in Coamo at the time. Its reported years of operation were 1880-1915. 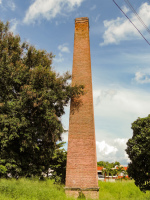 The brick smoke stack is 6' X 6' at the base and is 50' tall. According to a 1978 report by Eng. Luis Pumarada related to the construction of a subdivision near the ruins, the ingenio's masonry building that housed the sugar processing facilities next to the smoke stack was still standing and reportedly in relatively good shape, except for the roof, of which only the trusses remained. The report states that at that time, two of the exterior masonry walls with arched openings were relatively well preserved. Today, only the smoke stack remains. Aurelia is located about 750 meters South of PR-150 Km 2.3 in Barrio San Ildefonso.